Ever seen extra registry settings in your group policy manager console? This most likely came when you updated your ADMX templates with new Windows 10 templates, but no worries your settings are not lost! The settings will still apply on the supported operating system, but if you want to change the setting? Do I have to delete the group policy and create a new? No, no! The reason for “Extra Registry Settings” are simply that the ADMX files cannot translate the setting into a “clickable” settings. When you update the group policy templates they consist of two file types ADMX and ADML. ADML are located in a language folder, i.e. en-us. And this is where all the settings are translated into your language. So what actually happens when Extra registry settings is showing up for you is that a setting you have set long time ago is not found in any ADMX file anymore. All settings are matched to the a key and valueName in the ADMX file, and if the setting isn’t found “Extra registry setting” will show up. You can locate the central SYSVOL store. Backup the existing \\domain\Sysvol\domain\Policies\PolicyDefinitions folder and replace the ADMX/ADML files with the old once. When you are done don’t forget to restore. I would recommend this solution in a lab environment or very, very small environment. My favorite, logon to an old computer, or a management computer. Start my installing appropriate version of RSAT (Remote Server Administration Tools) and add the feature of Group Policy Management Console. 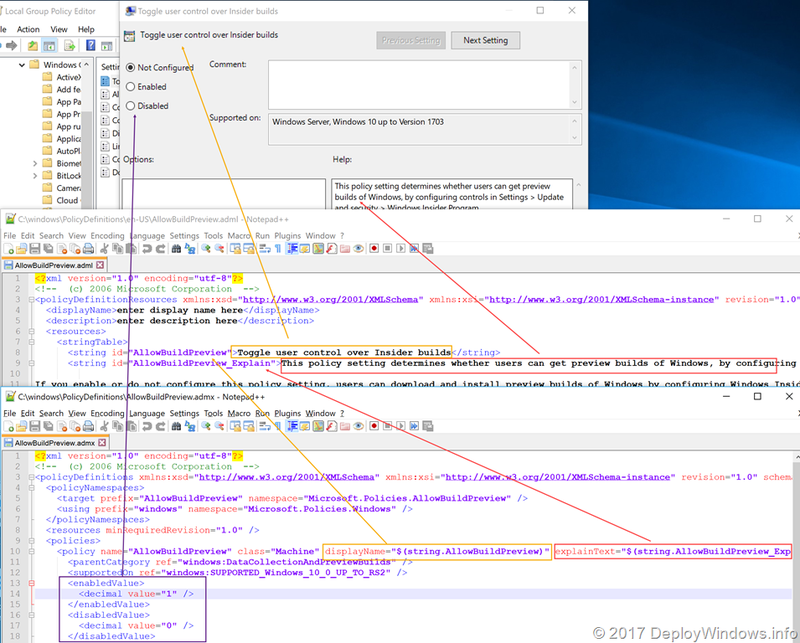 Place your old ADMX/ADML files in the local PolicyDefinitions folder (%WinDir%\PolicyDefinitions), NOT on the central store. Now to the nice part, create/change this registry key HKLM\SOFTWARE\Policies\Microsoft\Windows\Group Policy\EnableLocalStoreOverride [REG_DWORD] = 1. Restart the group policy mangement console, locate your group policy object and now you can manage the setting. When you are done, just change back the registry value to 0 or delete it. The best part with the last option is that you may have multiple PolicyDefinitions folders, like the illustration below, and depending what you want just rename the folder to PolicyDefinitions and restart GPMC – done. I got tips from a reader that to use a third option to “get rid” of the Extra Registry Settings. Basically that is to create your own custom ADMX/ADML with the setting you see. When the ADMX/ADML is in place, start editing your GPO and set the GPO to Not Configured and the setting will disappear. There may be 3rd party applications out there to help you as well. 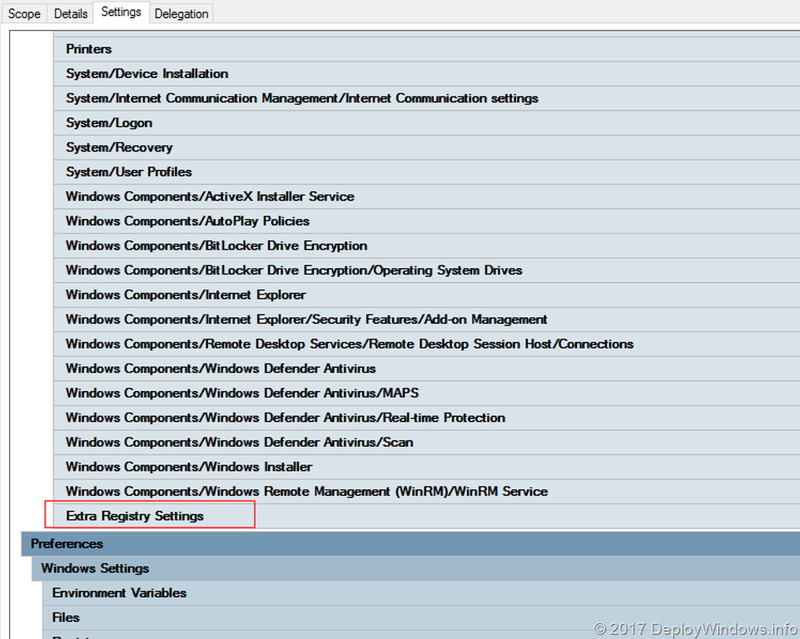 Next Next post: Dual scan or Windows Update for Business with ConfigMgr/Software Updates?